Some restaurants appear to have been given just the right name. The one that previously occupied this little chunk of Heaton’s Chillingham Road was called Cal’s Own. 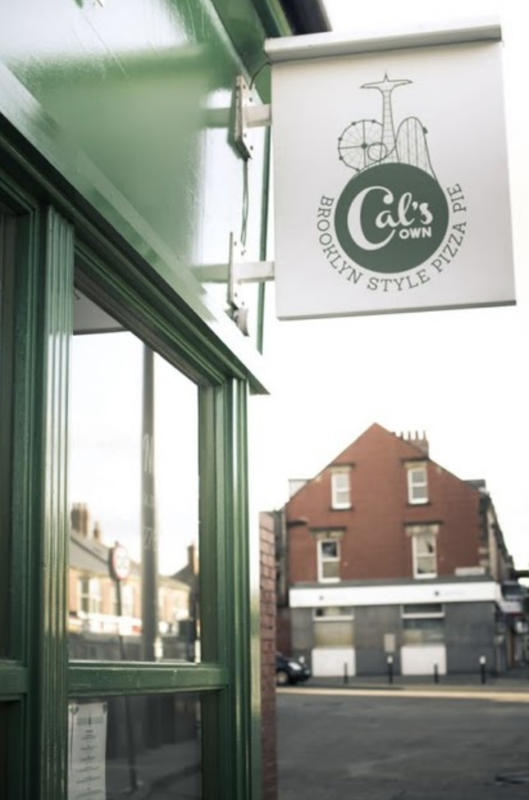 Not only did it produce the North’s finest pizzas (including a calzone, I guess), it was also owned by Cal. Or Calvin Kitchin, as he’s actually called. 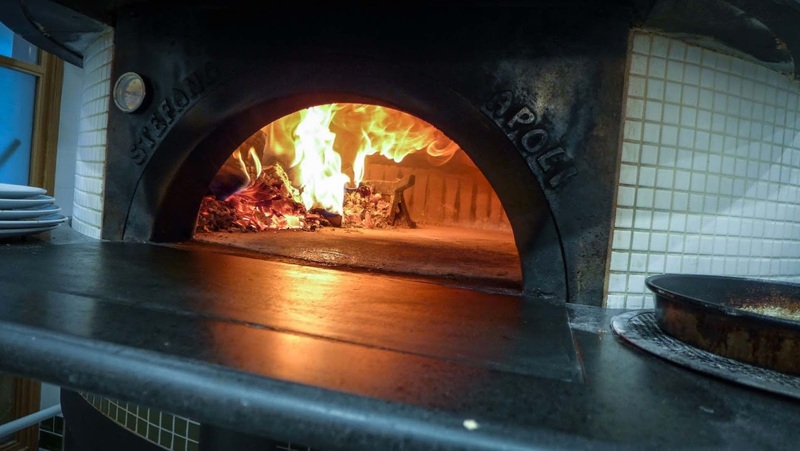 In February Mr Kitchin upped sticks to lucky Jesmond or, to be precise, upped logs, for he’s acquired the world’s best pizza oven, a wood-fired handmade Stefano Ferrara, in which he now produces even more authentic Neapolitan pizzas. The new Cal’s Own is within a San Marzano tomato (DOP) of getting itself accredited by the Associazone Verace Pizza Napoletana, which is a very big thing in the pizza world. If you live in Jesmond and you’re not a regular, you’re either mad or on a diet. Now the old Heaton joint has become Starks Kitchen. 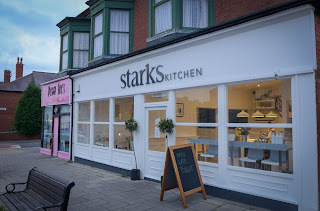 Apparently there isn’t a Mr or Mrs Stark (the owners are Game of Thrones fans) but the name certainly describes the feel of its interior. For anyone who used to make the pilgrimage here for pizza, the decor is a bit like the big reveal in an interior design programme: it’s very different, and, well... stark. The pale wood floors remain, but just about everything else has been given a healthy lick of brilliant white. Banquette seating has made the most of the space, on which a few black and white cushions are just about the only concession to soft furnishing. It’s all very serene, and, I imagine, a bit echoey when there are a few tables in. 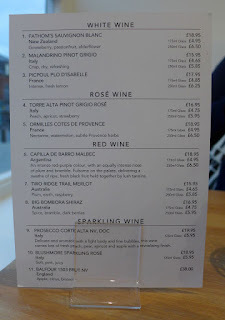 The short evening menu - they’re also open during the day when brunchy stuff like shakshuka, avocado toast and the like are available - is scribbled over four wall-mounted blackboards. It made for some fine reading and, happily, some very fine eating too. 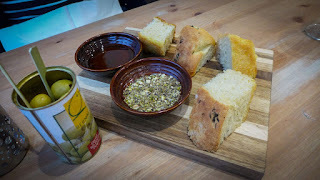 We started with superb focaccia, springy as memory foam, freshly baked that afternoon and served with good quality rapeseed oil and dukka for dipping. I like the fact that the wonderfully fleshy Spanish Gordal olives arrived in their tin. When you’ve shopped well, why not show off the label? 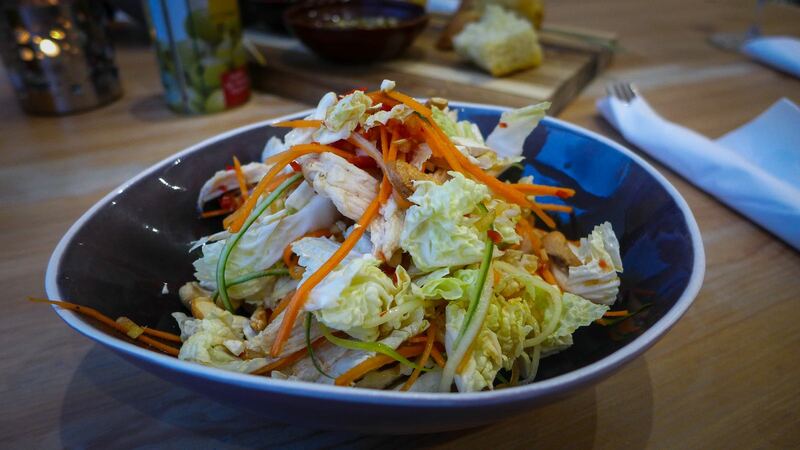 In what is almost certainly a first for us, Mrs Diner and I both started with salads. My own was an Asian chicken affair which tasted like the best possible thing to do with leftover roast bird. Generous amounts of fowl shared a bowl with shredded cabbage, carrots, chilli, garlic, ginger, cashews and, crucially, lashings of funky fish sauce. 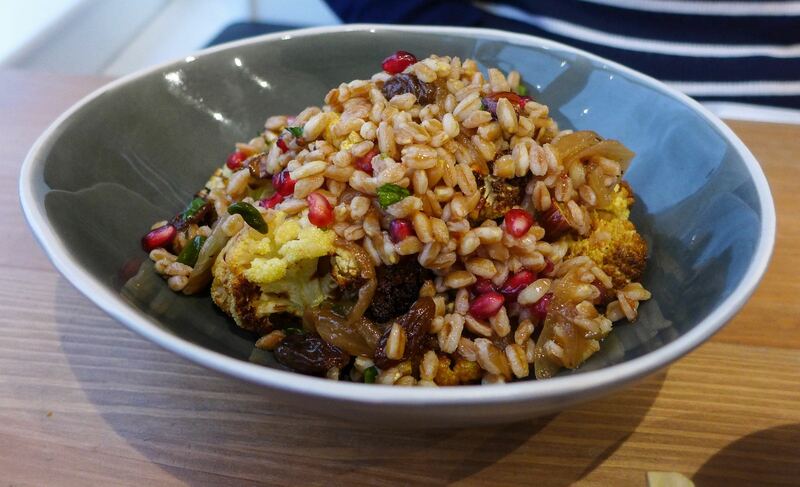 Mrs Diner’s dish saw cauliflower, roasted but still crunchy, paired with nutty whole grains of farro, pomegranate and almonds. As with our recent excellent meal at Harissa Kitchen, the influence of Ottolenghi could be detected in both dishes. Our mains were rather more cheffy and complicated. 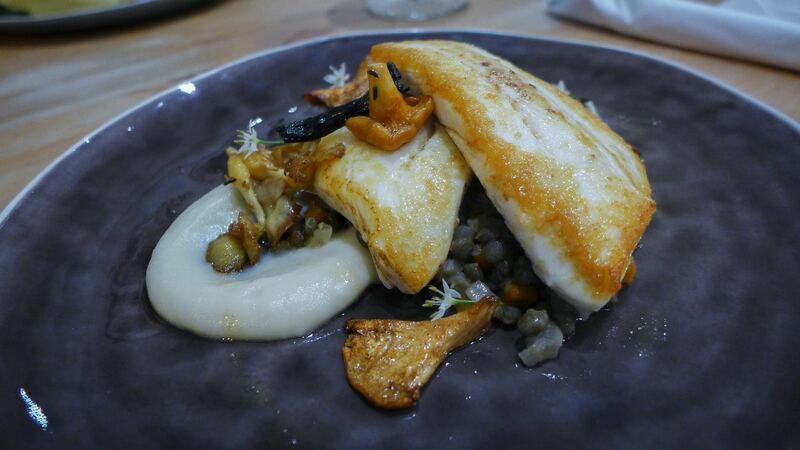 The braised lentils and velvety Jerusalem artichoke puree on my grilled halibut dish betrayed proper technique that comes from working in Café 21, as these cooks have. A picky sod would have to note that the fish itself was slightly overcooked. I am that picky sod. No such issues for Mrs Diner, whose juicy free-range pork chop sported a fine ribbon of fat and was a hefty reprimand to lesser lumps of pig. 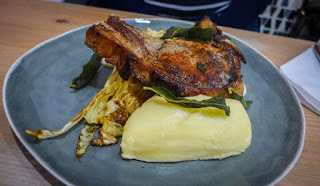 A comforting pillow of mash soothed, while the butter-roasted Hispi cabbage provided a welcome bitter top-note. I raised a glass of the violet scented Capilla de Barro Malbec to some rather delicious cooking. If the puddings had been to the same standard I might have had to consider breaking out a fifth star. As it was, they were merely enjoyable. 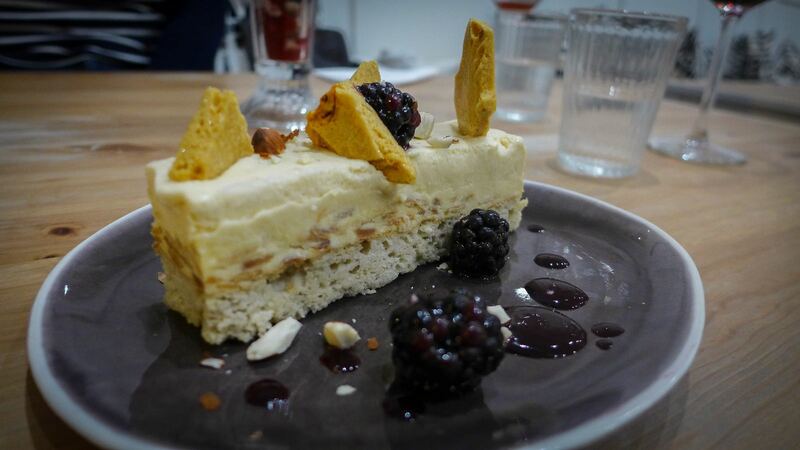 The honey in my parfait had gone rather AWOL, leaving the marzipan flavour of almond to dominate. The spongy base had not especially benefitted from time spent in a freezer. 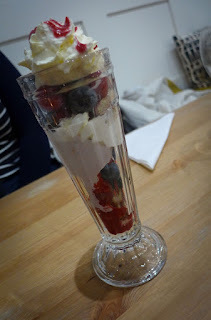 Mrs Diner is a sucker for a bit of old fashioned glamour so she ordered the sundae. It was an uncomplicated assemblage of fruit, dairy and sponge, which could have done with a bit of crunch. Sadly, we were the only people in the place during the one and a half hours of our Friday evening meal. This, given the quality of the cooking compared to some of the dreary chains packing them in across town, is a crime. I was assured by the charming owners, whose son is one of the two cooks, that this was highly unusual. All the same, I couldn’t help but wonder if the prices they’re charging - starters at about £7, mains at £15-18 - are a bit optimistic for this part of town. Personally, I think what we paid was fair for the quality of ingredients, but perhaps as we move through autumn into winter some less premium ingredients like pig or ox cheek, economically braised, might allow them to levy a less prohibitive charge on the cost-conscious diner. Unless they’re single-handedly trying to turn Heaton into a foodie destination. I also wonder if just a bit more furnishing - some curtains or blinds perhaps - might soften up the room, although its Zen-like calm will certainly appeal to many a modern taste. I guess they’d have to change the name if they did. Talking of taste, I have to commend whoever’s was responsible for the selection of music. Bowie, The Shins and the unimprovable “Out of Touch” by Hall and Oates helped get our evening off to a toe-tapping start. Starks has only been open for a few months, but this was a fine meal of assured cooking. 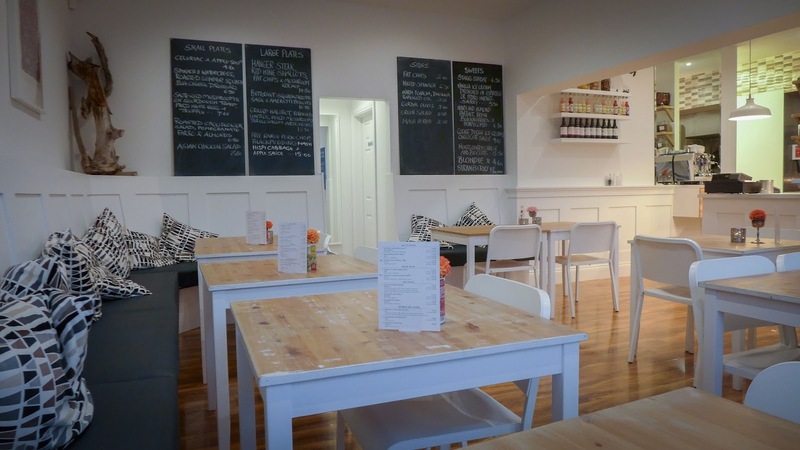 With a couple of tweaks here and there, this could prove to be that rarest of things: a genuinely interesting neighbourhood restaurant to where you will return again and again.